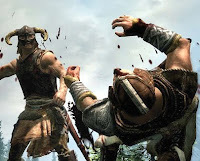 According to MCVUK, the Xbox 360 and Playstation 3 versions of Skyrim will be getting their price cut to just $30, with the PC version getting cut to $20. The price cut comes very unexpectedly since the game came out less than a month ago. One reason could be because sales for Skyrim have dropped recently. Look for the Skyrim price drop to go live at retailers everywhere later this week.